A quick YouTube search for the term “modern witchcraft” brings up the kind of videos one might expect: Brooklyn Witch Answers Questions and Debunks Myths About Magic; How to Be a Modern-Day Witch; and even, 13 Signs You Migth be a Witch (Yes, might is misspelled). These titles may seem relatively innocuous — funny takes on old superstitions turned into clickbait for bored internet users as the Halloween season approaches. But underneath the harmless realm of spooky paraphernalia to which many Western cultures have relegated notions of witches and wizards, there is a deeply disturbing reality with terrible consequences for vulnerable people around the globe. Horrific tales of limb amputations in Tanzania, sacrificial killings in India, people being burned alive in Papua New Guinea, and villages housing literally hundreds of women fleeing persecution in Ghana have all been reported in the last five years alone. Inhumane crimes against those accused of occult behavior still happen with startling frequency. More often than not, they’re committed against the most vulnerable members of communities including women, children, and the disabled. Horowitz, an editor who has written multiple books about themes of the occult in the US and abroad, began writing about issues of witch hunting in 2014 after he read reports of a brutal double-homicide in Queens, New York, that was reportedly motivated by accusations of witchcraft. Their report constituted one of the first major efforts to formally organize statistics on the subject, and the numbers were staggering. “It was really happening all around the world,” Horowitz said. “The most brutal of these attacks and the most regular of them seemed to be occurring in the nation of Papua New Guinea, but there were others in Nigeria, in Zaire (now the Democratic Republic of Congo), in Latin America, in India, and Indonesia.” These countries also happen to have some of the lower per capita income in the world. Of course, this practice is not new. Allegations of witchcraft have been documented in Europe even before the practice was condemned in the Bible. The famous Salem witch trials in colonial New England in the US brought the practice of “witch-hunting” to the forefront of the newly created American society. But the frequency of witchcraft-related violence outside of Western culture has garnered significantly less attention among academics and the popular zeitgeist until recently. However, Horowitz believes that lack of documentation of these crimes doesn’t necessarily mean they are a recent phenomenon. Unlike the black-clad witches of Halloween lore, the witchcraft that is persecuted in other parts of the world comes from from a variety of ancient spiritual beliefs in the supernatural, and takes shape in many different forms. Still, connections between popular conceptions of witch-hunting and its darker modern contemporary do exist. In the Salem witch trials, turbulent social conditions and economic strife have largely been blamed for the paranoia that led to the persecution of town outcasts labeled as witches. In countries lacking widespread access to basic medical services and education, the inevitable maladies of illness, crop failure, and other occurrences which might otherwise be explained through science can often be more readily accepted as the products of malevolent spiritual forces rooted in indigenous beliefs. 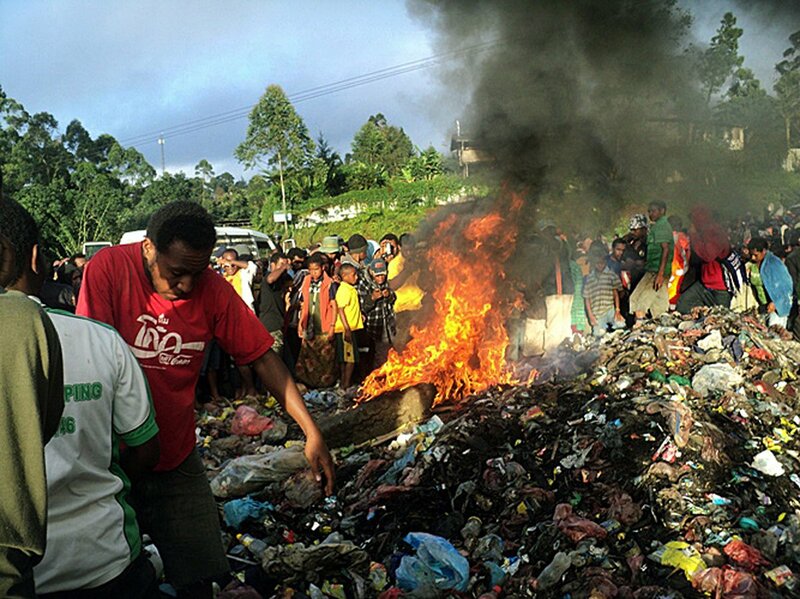 Bystanders watch as Kepari Leniata is burned alive after being accused of witchcraft in the Western Highlands provincial capital of Mount Hagen in Papua New Guinea on Feb. 6, 2013. In 2013, 20-year-old Kepari Leniata was publicly burned alive in Papua New Guinea after a spiritual diviner accused her of sorcery following the death of a young boy in her village. Journalists reported that the boy’s symptoms indicated a tragic case of rheumatic fever, but in a country where access to modern medical advice is limited, deep-seeded beliefs in the existence of evil spirits emerged as the more likely candidate. Stories like Leniata’s are unfortunately more common than one might assume in the face of a rapidly globalized economy that is changing social and economic conditions in some of the world’s poorest places. The Indian news outlet Live Mint reported in 2014 that nearly 400 witch-hunting related murders occurred in a single province between 2000 and 2012, making up nearly a quarter of all of witch-hunting related murders in the country during that time. Notably, the rural, hilly province has severely limited access to hospitals, doctors, and any sort of emergency care. As was the case in Papua New Guinea, lack of access to adequate health care and education systems seems to further exacerbate the prevalence of supernatural accusations and violence. “There are societies where somebody will be struck with an illness, and the reasons and the treatments seem so far out of reach that some form of reasoning based in ancient superstition seems to provide a more ready, symmetrical answer than actual medical care,” Horowitz said. Another common denominator is social unrest. A 2013 article in The Spectator traced the resurgence of witch-hunts in Africa since the 1980s to growing pockets of wealth among a generally impoverished population largely denied access to the gains of global markets. “In central Africa, rapid urbanization, urbanized poverty, and abandoned children on the streets, who tend to be unprotected by any of the various courses or institutions in society, seem to be this combustible mix that lead to these accusations of witchcraft,” Horowitz noted. These factors, combined with long-standing indigenous beliefs in the existence and activity of spirits and other supernatural forces, can lead to an environment where communities seek scapegoats to blame for negative events, often with deadly consequences, Federici argued. 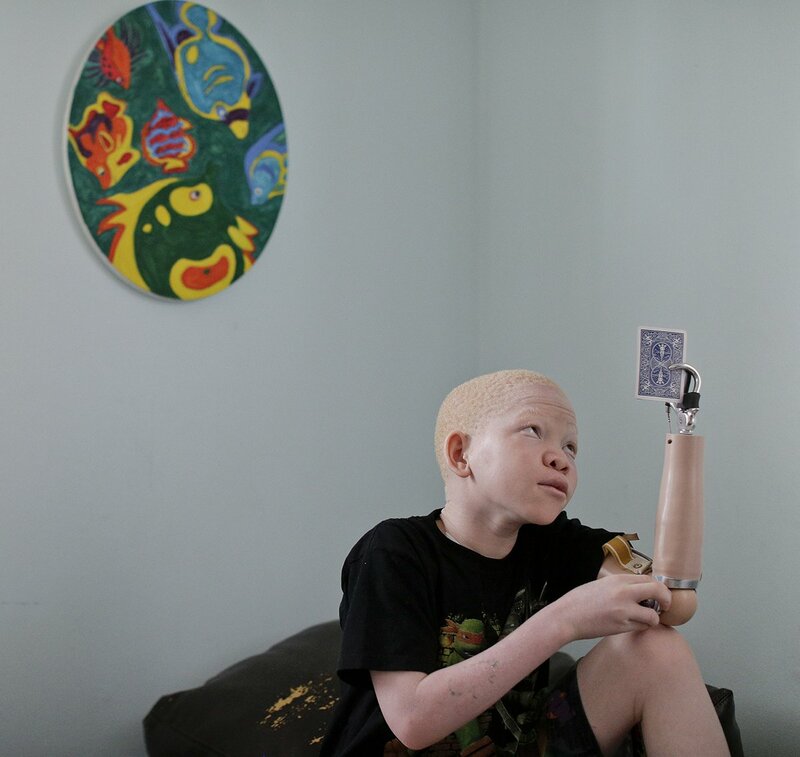 In Tanzania, albino children are hunted down and subjected to amputations of their limbs, which can fetch a high price for their use in potions and as good luck charms. In Malawi, Reuters reported that an epileptic man was burned to death after he was accused of being a vampire, one of six deaths in the last month. In Ghana, Memuna Abukari, an elderly blind woman, was banished from her village on grounds of killing someone using witchcraft. She faces death threats from her own son if she attempts to return. Perhaps what is most insidious about the statistics concerning violent persecutions of people accused of witchcraft is that they plainly illustrate that such acts are overwhelmingly committed against society’s most vulnerable groups. “In Central Africa it seems to be children who are most often targeted,” Horowitz said. The least-powerful members of social groups become easy targets for scapegoating as they lack recourse to defend themselves against the ire of their communities. Mwigulu Matonange Magesa, 12, adjusts his prosthetic. Mwigulu and four other children from Tanzania have been in the US to receive surgery and prostheses for limbs that were cut off to be used for witchcraft. People are often shocked when they hear about the scope of this issue. Finding ways to end these horrific acts of violence might seem complex, but taking action is imperative. Global Citizen campaigns for freedom, for justice, for all. This persecution of society's most vulnerable members is a violation of human rights which must be addressed by a broad coalition of members. As we work to achieve the United Nations’ Sustainable Development Goals, ending the practice of witch-hunting means enacting gender equality, reduced inequalities, and peace, justice, and strong institutions. You can take action on these issues here. Solutions must involve changes to legal systems, increased educational awareness and access to health services, and cultural shifts from within the communities where these practices occur, according to the OHCHR report. Giving law enforcement the power to prosecute these crimes will help to protect people in the short-term Horowitz told Global Citizen. Papua New Guinea took positive action in 2013 when it repealed its 1971 Sorcery Act, a law that many believed legitimized the belief and persecution of supernatural crimes. The year before, a state in Nigeria outlawed accusing children of witchcraft and sorcery. Slowly, countries are moving in the right direction, though more work needs to be done. At the international level, the OHCHR’s efforts to formalize the collection of statistics will be a continuously important tool as researchers and legislators seek to understand the exact nature of how and why these violent trends occur. Horowitz believes all of this is possible. “This isn’t something that is so completely out of control, as deeply concerning as it is, that one should feel a sense of helplessness,” he concluded.